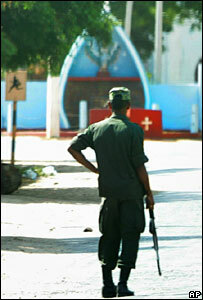 Sri Lankan forces have been accused of targeting a church in the north-western district of Mannar. The government denies this, but eyewitnesses described how the military attacked the church. An international aid worker has confirmed it. One woman was killed and more than 40 people injured in the incident. It comes after early-morning clashes in Mannar between the Sri Lankan navy and Tamil Tiger rebels, in which more than 30 people were said to have died. Some 200 people had been sheltering at the church when a grenade was thrown in, causing death and injury. The government says the church got caught in the middle of a firefight. In the sea attack, the military said the rebels fired at them just off the coast of Mannar. They said they responded with air and artillery strikes, and helicopter gunships were called in. There was heavy fighting and casualties on both sides. The Sri Lankan navy said six sailors were killed in a Tiger attack near Mannar. Eight rebel boats were destroyed, and about 25 rebels killed. The Tamil Tigers dispute this and say they killed 12 navy personnel - two rebels were injured, no-one killed. Nothing like this has happened since the ceasefire was signed four years ago, says the BBC's Demeetha Luthra in central Sri Lanka. War is now looking inevitable, she adds. The government has been targeting the rebels since a mine attack on a bus on Thursday which left 64 people dead. The rebels have denied responsibility for the claymore mine attack. Suspected attacks by Tamil Tigers on security forces and killings of Tamils blamed on the army and others have soared in recent months. Earlier this month the rebels refused to meet the Sri Lankan government in talks in Oslo, mediated by Norway.